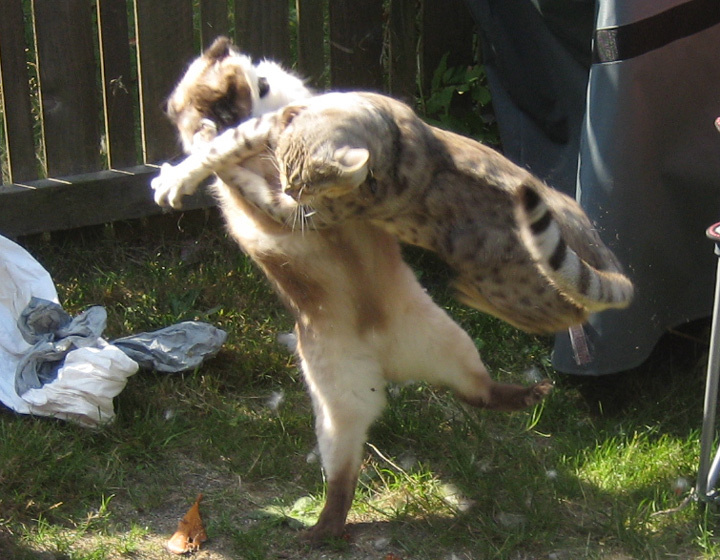 I took this photograph of stray cats fighting in my own front yard! Yes, they were howling loudly over territory. There is nothing more annoying and for some people, distressing, than seeing or hearing a bunch of stray cats fighting. Neither is there a worse smell that that of a spraying male cat! The thing is strays in your community will often fight and spray, especially if they are feral cats that haven’t been neutered or spayed, and if a solution is not come up with, there is virtually no hope of sorting out the problem. Before you look at how to deal with a spraying or fighting cat, you must first look to see whether it is a stray or a feral cat. A stray is a cat that will have had a home once, may have run away, been neglected or abandoned, thrown out by its owner and left to its own devices, or other similar situations. Stray cats will normally respond rather well to humans, and may not be averse to being fed, petted or similar interactions. 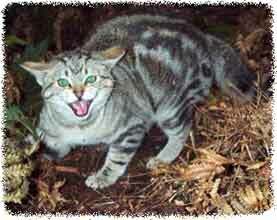 A feral cat is one that has been bred into the world of the streets, so to speak. They may be the babies of a cat that has been lost, (a stray) or the offspring of other feral cats before them. These cats are much less tame than their stray counterparts, and will be very hard to deal with in most situations as they do not tend to respond to people very well, simply because they are not used to them. Stray cats that are ones that have been abandoned or have run away may already have been spayed or neutered, so usually the fighting and spraying won’t be so much of a problem to deal with. A feral cat, however, will not have been, so it is more than likely these critters that you hear of when you know there are cats fighting outside. There are many so called “cat repellants” on the market, that have been said to stop cats fighting and spraying, but in reality, very few of these actually work, and you will more than likely end up spending a small fortune on products and gadgets and not getting any help from them. Another way in which you can learn about dealing with spraying and fighting stray cats is to speak to the local city animal services. Most of them will have programs, such as the TNR or CNR programs, (which we will go into in just a moment) and if not, they can normally point you in the direction of a good wildlife control professional that you will be better educated to deal with your specific situation. The TNR or CNR programs are trap, neuter, release or catch, neuter, release programs that do exactly what it says on the tin, and for the most part, these programs have been proven to help with fighting and spraying cats, simply because having them “fixed” usually helps with the situation by taking a lot of their aggression out of the situation. Just as the name sounds, the stray cats are caught, taken to a clinic or Vet that holds the program, neutered or spayed, and then either released, taken to a shelter if they are tame enough to be re-homed, or cared for by specific groups of volunteers that are qualified to help with the growing stray cat population. Stray cats can be vicious, but are not normally aggressive to people (with one exception at a hotel I was hired to work at). Because the people at the hotel were feeding the cats. Never feed stray cats - it causes several problems.